Millions of school children have been told that Isaac Newton was sitting under an apple tree when an apple fell on his head, giving him the idea that led to his description of gravity and his laws of motion. I prefer to think that he was sitting under a tree pondering how Charles Cotton, who had written the fly fishing chapters of the Compleat Angler only a few years earlier, could cast such a light line. It's all about physics. It turns out that the taper of a line makes the line tip speed up as it "turns over." 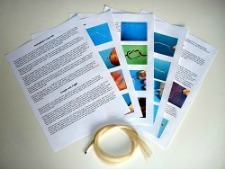 The crack of a whip is a small sonic boom created when the tip actually breaks the sound barrier. Tenkara lines don't break the sound barrier, but the physics of cracking a whip and casting a tenkara line are very much the same. The energy stored in the line as it is cast helps the light line tip overcome wind resistance. I don't want to get into the whole Force = Mass X Acceleration stuff, because once you get past assuming a vacuum, things get pretty complicated. Assuming a vacuum is a bit like assuming you have permission to fish the Upper Beaverkill. Things could get very complicated. Very complicated indeed. The sad reality is that you're never going to cast in a vacuum (and you're never going to get permission to fish the Upper Beaverkill). You'll always have to overcome wind resistance, which is the factor limiting how light a line you can cast. Charles Cotton was able to cast so light a line because a wet horsehair line is actually pretty dense, and has enough weight to overcome its wind resistance. For modern line materials, fluorocarbon is quite a bit denser than nylon mono, so it is easier for a fluorocarbon line to overcome wind resistance. Whichever material is used, you want the end of the line to which the tippet is attached to be heavy enough to turn over the tippet and fly, yet light enough that it lands on the water softly. To get a line where the tippet end is as light as possible and yet have a line that is heavy enough for stiffer rods to cast, it is necessary to taper the line. This is particularly true for rods like the Daiwa Keiryu-X. That is not to say that they can't cast a level line, it's just that a level line heavy enough for them to cast easily is heavier than necessary to turn over the tippet. The softer rods (for example a Nissin Zerosum or a Suntech Kurenai) do not require as heavy a line to cast easily. A level line that is heavy enough for them to cast is not so heavy that it causes substantial disturbance when it lands on the water. For them, a level line becomes a reasonable compromise - not too heavy, not too light, and not too complicated. I believe that is why in Japan, 5:5 rods are generally thought of as being level line rods. And that is not to say they can't cast a tapered line, it's just that getting the taper right so that there is enough mass at the line tip without making the whole line too heavy is a tricky business. Most of the tapered lines I have come across are much heavier than necessary for all but the stiffest of rods, with one exception and one special case. 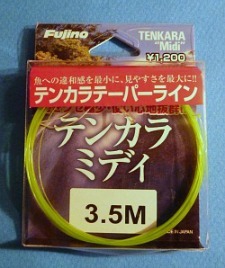 The exception is the nylon tapered lines made by Fujino of Japan - the Tenkara Midi and Soft Tenkara lines, and the Fujino White Tenkara Lines. These are made from nylon and are essentially very long, very hi-vis knotless fly fishing leaders. They turn over extremely well (because of the taper) but are not that great in the wind (because they're nylon). The best thing about them (aside from being extremely visible) is that they are not too heavy for even soft rods. The special case is for particularly long lines. Not long ago I had a session with a couple spey casting instructors, playing around with some very long rods (up to 20') and very long lines (considerably longer than the rod), and we all agreed that the lines that worked best were the tapered ones. They were also fluorocarbon, giving them not only the taper but also the density required to fully extend and turn over. 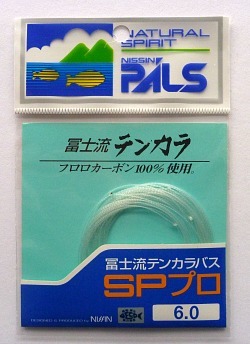 The Nissin PALS Fuji Style SP Pro is an excellent example of a tapered fluorocarbon line that is made by a tenkara master in Japan and comes in lengths up to 6 meters. 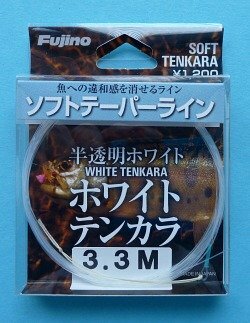 Most of the commercially available furled tenkara lines are very easy to cast. That is because they are heavy. A line that is heavier is easier to cast. It loads the rod nicely and is unaffected by wind resistance. The only problem is that you can't keep it off the water's surface. All lines sag but heavy lines sag more and you just can't keep them off the water. It is easier to cast with a heavy line, but it is easier to catch (fish) with a lighter line. To me, the very essence of tenkara is the light line, which together with the long rod allows you to keep the line off the water's surface. That minimizes drag. Less drag pretty much equals more fish. In addition to light weight, for me high visibility is critical. I write about hi-vis lines a lot, and the photo above illustrates why. 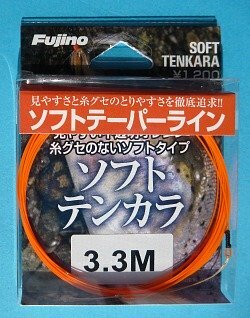 With a dark forest background on both sides of the stream, there is no way I could see a lo-vis or even medium-vis tenkara line while I am casting. If I can't see the line as I am casting, it will take precious time to find it after the cast. Because strikes occasionally come as soon as your fly hits the water, you have to be ready immediately. If your line isn't easy to see you'll certainly miss some of the strikes. For a tapered line that is not too heavy and also extremely visible, I would suggest the Fujino tapered nylon lines. For the stiffer rods, or for fishing in a breeze, the denser twisted fluorocarbon Nissin PALS lines would be better. They're not hi-vis, but the tapered horsehair lines you can make with the Horsehair Line Kit can be tailor-made for your specific rod. If you've never tried them, they will surprise you.